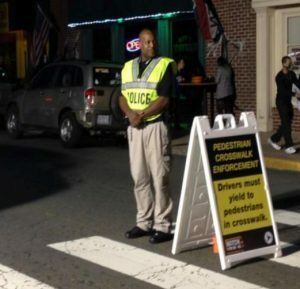 Photo: Creedmoor Police Officer J. Robertson is ready to help pedestrians cross the street on Halloween. Credit: City of Creedmoor. Home to nearly 60,000 residents, Granville County lies north of Raleigh and Durham. Its principal urban areas are the county seat, Oxford (population 8,600), the City of Creedmoor (population 4,200), and the Town of Butner (population 7,600). Oxford and Creedmoor both have historic, walkable downtowns and they have sought to improve safety and raise awareness about pedestrian and cyclist issues through the Watch for Me NC program. Granville County partnered with Granville Greenways, the Granville-Vance District Health Department, the County Sheriff’s Department, the cities of Oxford and Creedmoor, the Town of Butner, and their police departments to spread the Watch for Me NC message and conduct enforcement operations. Greenville County has heavily relied on all of these partners to help get the word out, organize events, and distribute program materials. Granville County has undertaken a range of public outreach activities. Local media helped to spread the word about the Watch for Me NC program with both local papers running front page stories about the effort. Staff also conducted outreach at a local school board meeting, Walk to School events at two schools, a Granville Greenways meeting, the Creedmoor Music Festival, and at Oxford’s NC Hot Sauce Festival. Pedestrian and cyclist safety also got a boost when both Safe/Active Routes to School and Watch for Me NC program were incorporated into two local Christmas parades in Butner and Creedmoor. Goodie bags with Watch for Me NC safety information were distributed at the Walk to School events. Rack cards, brochures, posters, bumper stickers, bike lights, and bracelets were given out at these events as well as at business locations and a local community college. Granville County actively encourages each jurisdiction to carry out their own Watch for Me NC activities. The City of Creedmoor has been particularly active in Granville County’s Watch for Me NC program. The Creedmoor Police Department has conducted a Bicycle Rodeo and a Walk to School Day. Creedmoor’s Police Department has also worked to institutionalize Watch for Me NC in their regular operations – each patrol squad is required to conduct one Watch for Me NC enforcement operation each week. Creedmoor’s enforcement operations primarily focus on enforcing pedestrian right-of-way laws in crosswalks. One key outcome from Granville County’s Watch for Me NC program is a stronger desire to make more infrastructure improvements in the community. The program’s trainings and enforcement events helped bring professionals from police departments, public works, and planning together to learn from each other and create solutions together to address problems and concerns. A primary lesson learned is the importance of seeking partners and coming up with a plan of action early in the program. Another key lesson learned is that some partners are more engaged with the program than others and it is important to utilize their enthusiasm to motivate other partners in the community. Thanks to Justin Jorgensen of the Granville County Transportation Department and Lieutenant Wallace of the Creedmoor Police Department for their work with the Watch for Me NC program and for the information provided in this profile.